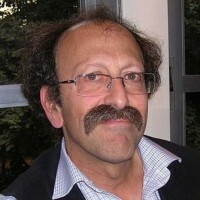 How scholar and activist David Shulman [in photo] showed that you can oppose what a state is doing without rejecting the state itself. Sometimes sanity prevails. . . . David Shulman, renowned scholar of Indian religions, won the country’s highest civilian honor—even after announcing that he would donate the prize money to an intensely controversial Israeli-Palestinian group. . . . The Israel Prize is a kind of local Nobel, with the state … funding the awards. In contrast to the Nobel, the fields for which the prize is granted vary from year to year, in order to give recognition to a wider spectrum of achievement. It’s very much a national institution: The prize ceremony is held on Independence Day, with the president, prime minister, and chief justice in attendance. This year one of the fields was philosophy and religious studies. A committee of four judges—chosen by a branch of the Education Ministry firewalled from politics—named Shulman. As a scholar, the Hebrew University professor was a natural choice. He could add it to the MacArthur fellowship he won nearly 30 years ago and a list of other honors . . .
On the other hand, Shulman most definitely didn’t get the prize for his activism against the occupation in general, or for being a co-founder of Ta’ayush in 2000. In Arabic, the name means “Living Together” or “Partnership.” The Israeli-Palestinian organization started out organizing food convoys to villages in occupied territory that were cut off by Israeli forces in the early months of the Second Intifada. Afterward a major focus became the South Hebron Hills, the southernmost part of the West Bank. There, a rural Palestinian population has suffered constant harassment from extreme and violent settlers and from the Israeli military, which has sought to evict them from much of their land.
. . . [Rightwing Jewish Home party leader and education minister Naftali] Bennett issued a short statement, saying that the prize was “given to Professor Shulman for his breakthrough research into the literature and culture of southern India. Minister Bennett believes that one should not disqualify someone for his opinions, left or right.” It’s possible he decided that denying the prize wasn’t worth the likely public and legal fight. It’s also possible that in an unexpected fit of good sense, he decided that the prize really should be outside politics. These things happen. People are complicated.
. . . Last week, shortly before the award ceremony, [Shulman] released a short video describing Ta’ayush’s work. At the end, he said, “I thought over whether it was appropriate to accept the prize in light of the deteriorating situation, which recently has included persecution of Ta’ayush activists and other peace and human rights activists by the establishment and the far right.” The subtext, I think, was that accepting the prize might suggest acceptance of the state’s actions; rejecting it would be agreement to place himself and other dissidents outside the community of Israelis. And so, he announced, he would donate the prize money—about $20,000—to Ta’ayush. The right-wing group Ad Kan (This Far) demanded that Bennett prevent Shulman from getting the money. Both Netanyahu and Bennett, it appears, realized that it was much too late and too costly to object. . . .